Rapid, nasal mag? mag? mag?, or yak yak yak. Description: Sexes similar. Very long tail with iridescent green highlights. Black bill, head, back, and throat; iridescent green wings; and white belly, shoulders, and primaries. White wing patches flash in flight. 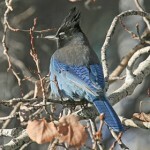 Habitat: Wooded canyons, riverbottom forests, and forest edges. 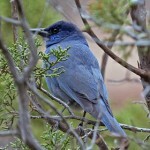 Will range out into more arid environments wherever there are thickets of shrubs or small trees to provide nest sites. Where in Nebraska: Common permanent resident in western Nebraska. Rarer in east, but can be found almost statewide during the breeding months. 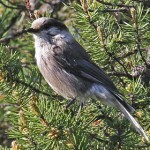 Field Notes: Birds that are casually seen in the eastern U.S. may be escaped cage birds. 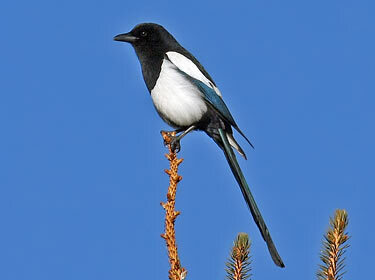 Fun Facts: Black-billed Magpies build very large nests that can take up to 40 days to construct.